This morning I woke up to the sounds of Laurika Rauch’s song Kinders van die Wind (“Children of the Wind”). Lance du Plessis, my radio interviewer, was broadcasting from the KKNK Fees (Klein Karoo Nasionale Kunstefees) in Oudtshoorn. In 1981, my last year in Stellenbosch, and my Prim year at Helshoogte, Laurika had supper with us one Sunday evening in the res eetsaal. Against the university rules “No alchohol allowed in University residences” we went and bought red wine directly from the farm Oude Libertas for the evening meal! After all, I was the Prim and having Laurika to supper was something special for the house. Maybe singing on Sunday nights was also against the rules – I can’t remember! Playing tennis on Sundays was definitely a No-No! 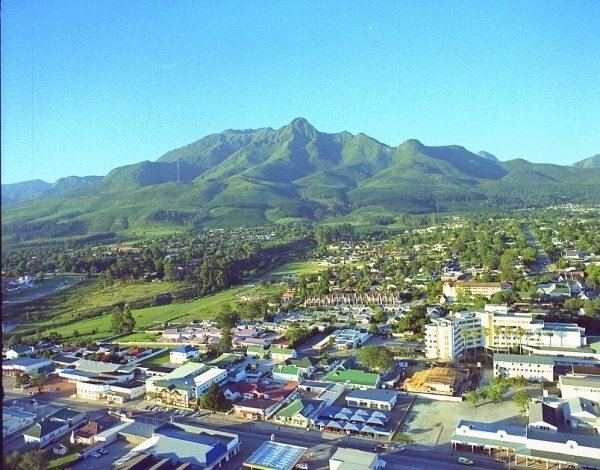 Those were 6 years of good memories from Stellenbosch. The following year, 1982, I was the nothing, just a troepie doing my two year’s National Service at the Infantry School in Oudtshoorn. Those were 2 years of bad memories from Oudtshoorn (and later Youngs Field Wynberg and 1 SAKK Bataljon, Eersterivier). Tonight, Sunday night, Laurika is singing at the KKNK 20th Anniversary Celebrations in Oudtshoorn. 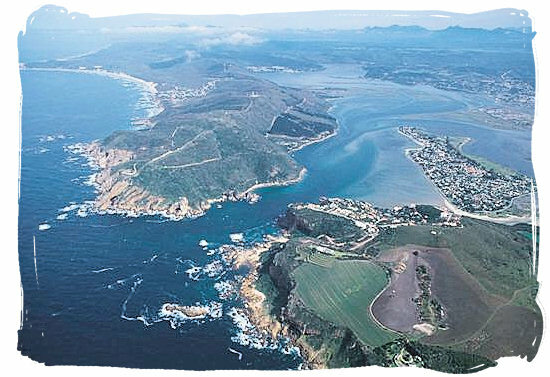 Van lank-vergane skepe in die kelders van die see. 1976 – South Africa had just got TV for the first time! The SABC service consisted of one channel that commenced at 18h00 with a Scripture reading and closed at 23h00 with the National Anthem and the flying orange, white and blue flag. But it was already old hat for me because I had lived and gone to school in the USA in 1975. 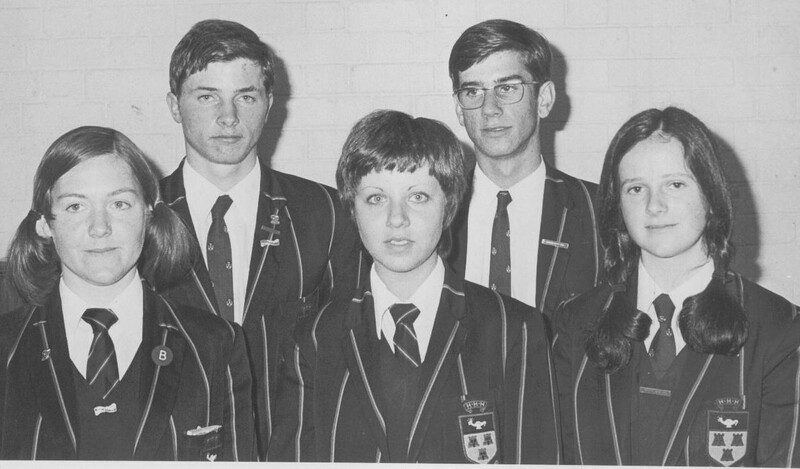 I returned in January 1976 and became a MATIE in the February, the first person in our family to go to University. Mom was so proud – when she dropped me at Helshoogte and attended the first parent’s function, she insisted on wearing a hat! Anton Scholtz was already there, studying a BSc in his second year. He came from Kingswood College in Grahamstown. We became friends – I’m not sure why, but he did drink more beers than anyone I knew, he partied harder than anyone I knew, he played rugby better than anyone I knew and he outran anyone I knew on what was known as the Berg Pad – even if it was after a party that continued until five in the morning! He was not known as the Mine K***** for nothing. He captained the Res team, played rugby for Maties, served on the House Committee and had a bright green Volkswagen Beetle. It was known as the Automatic Apple! 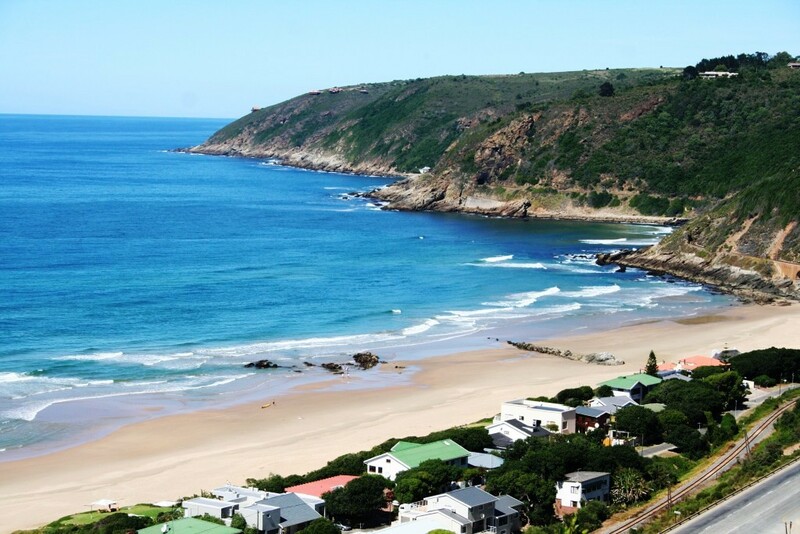 It took us all over the Cape Peninsula, and in the summer months to Bikini Beach in Gordon’s Bay. On the way back to Stellenbosch, we would stop in at our home in The Strand. 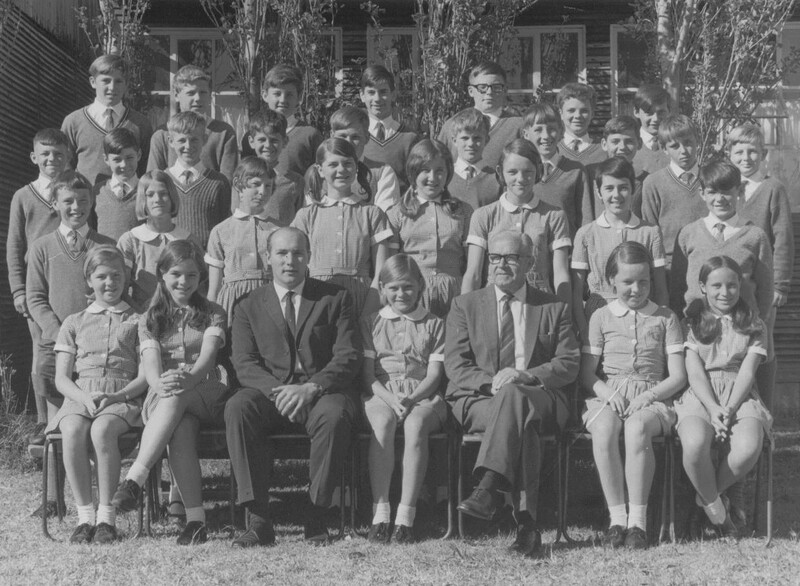 My sister, Ingrid, was still at school at Hottentots-Holland High. It soon became clear that the visits at home were not for my company. Ingrid became Head Girl at HHH, then became a Matie, too, and at the time that I was Primarius at Helshoogte, she became Primaria of Serruria – her ladies’ residence (and where Jessica, their daughter and our Godchild, is now in residence.) 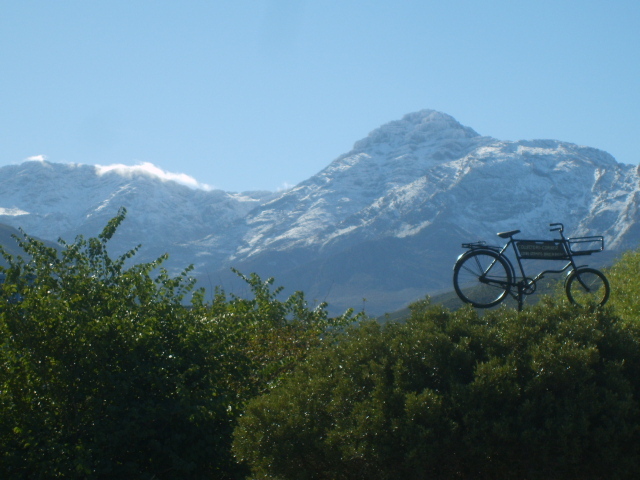 It was quite something at the time at Stellenbosch University to have a brother and sister – and Engels nogal! – in charge of two University Residences. 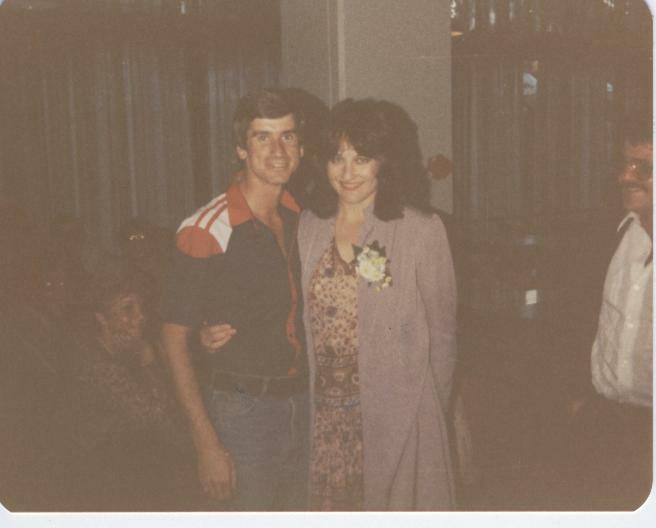 Ingrid also became Anton’s wife in January 1983. Their wedding photographs show me with very short hair! That’s because I was in my second year at Infantry School in Oudtshoorn where Anton, still ahead of me, was a Lieutenant when I had arrived as a troop in 1982. He occasionally made me run when he found me not wearing my beret! 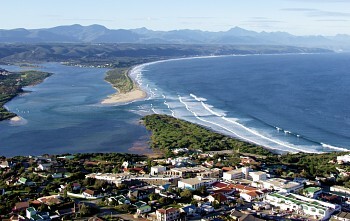 Anton’s family came from Cradock and they had a holiday house at Keurboom’s Strand near Plettenberg Bay. As students, we sometimes spent time there. 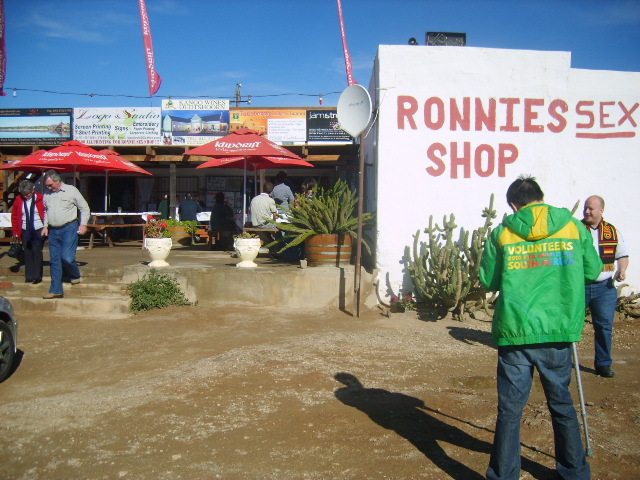 As soldiers in Oudtshoorn, we often spent time there because Keurbooms was but two hours away from the military base, and a very welcome diversion. As officers, they were able to go out most weekends. As a troopie, I had to AWOL. We ate braaied steaks for breakfast, lunch and supper. They somehow always came armed with boxes of steaks for the weekend that, I believe, were destined for the Troops’ Mess but never got there! 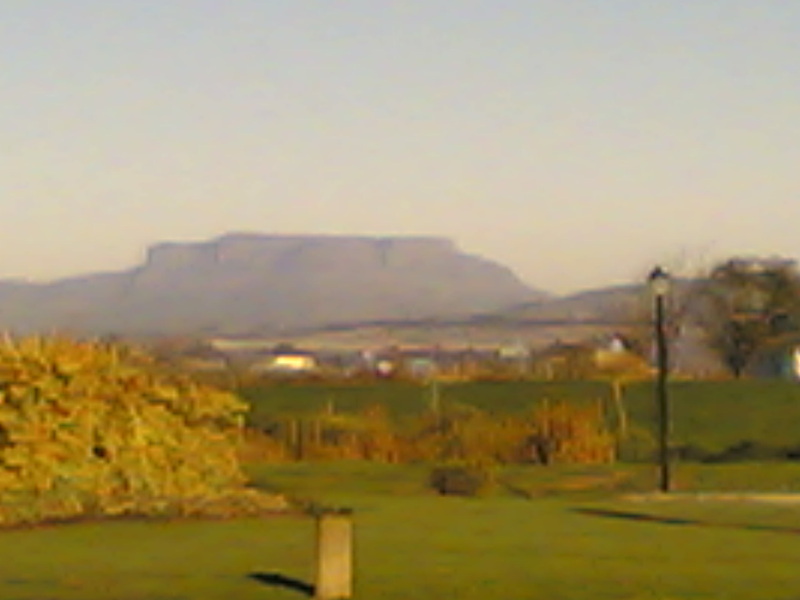 My Dad died in my first year at Stellenbosch – 1976. But the Scholtz’s homes were always open to us as a family – that’s the people and the way they were! I remember a Christmas that Mom, Ingrid and I spent in Cradock – it came complete with a Karoo thorn tree that doubled up as the Christmas tree. 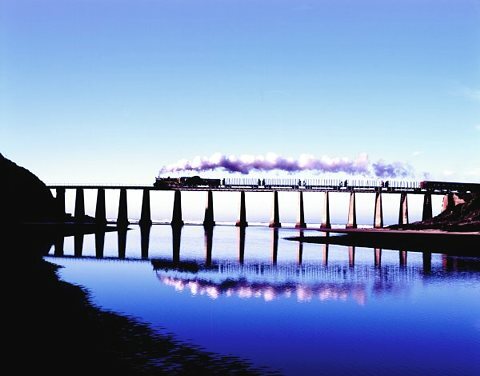 Uncle Piet was the doctor in Cradock. But Aunty Ina dished out the medicine! She issued the prescriptions, handed out the pills and gave the instructions! She was the matriarch of the family. You didn’t want to cross paths with her! She organised everyone with an iron fist. But what loveable people they were. Although they were “in-laws”, they were always great parents for Ingrid. After my Mom died in 1986, whilst I was teaching at Grey, they became almost surrogate parents to me, too. They were always interested in my progress and what I was doing, and always there to assist and support. Even after Pera and I got married, and Sean and Phillip arrived on the scene, they were there for us. So much so, that Pera, Sean and Phil (and many others) refer to them as Oumie and Gramps. And so it was with great sadness when Oumie became ill a few years ago. But, in her unique style, she fought even that cancer with strength and determination. We saw her just three weeks ago when they were staying with Ingrid and Anton here in Port Elizabeth. It was obvious that the illness was taking its toll and that she had wasted away to that shadow of her former self. When we said goodbye, we knew it was for the last time. 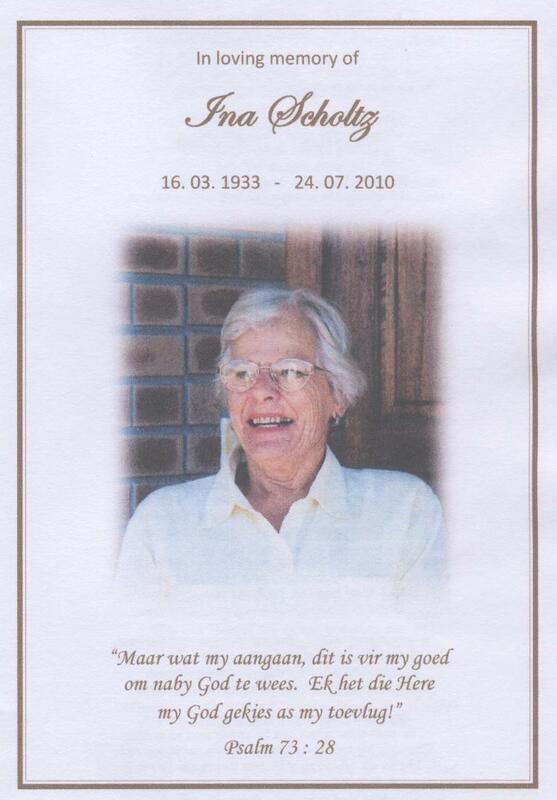 Last Saturday, just after I returned from John Clarke’s funeral in Alexandria and just before Grey Bloem and Grey PE’s 1st rugby teams started to do battle before thousands of spectators around the Pollock Field, Oumie passed away in Oudtshoorn. We have lost our Oumie. But Uncle Piet has lost his wife, and Anton, Ingrid, Rael, Leonie, Gerhard and Pieter, and all their families, have lost their Mom and their grandmother. Pera, Sean and Phillip join me in extending our deepest sympathy to you all. We take solace in the fact that she is in That Place where her pain is no more. And, whilst death takes away the person from us, it can never take away the relationship or the memories.